VW Furniture Carpenter is a wonderful choice when it comes to excelling the business of the furniture shop and selling the furniture products across a wider platform of e-business. This WordPress theme is also an excellent choice for the interior shop or in case you have opened a wood shop related to house decoration furniture, you can but this one and it is a good choice for your furniture business and besides this, it is available at an affordable rate in the market. 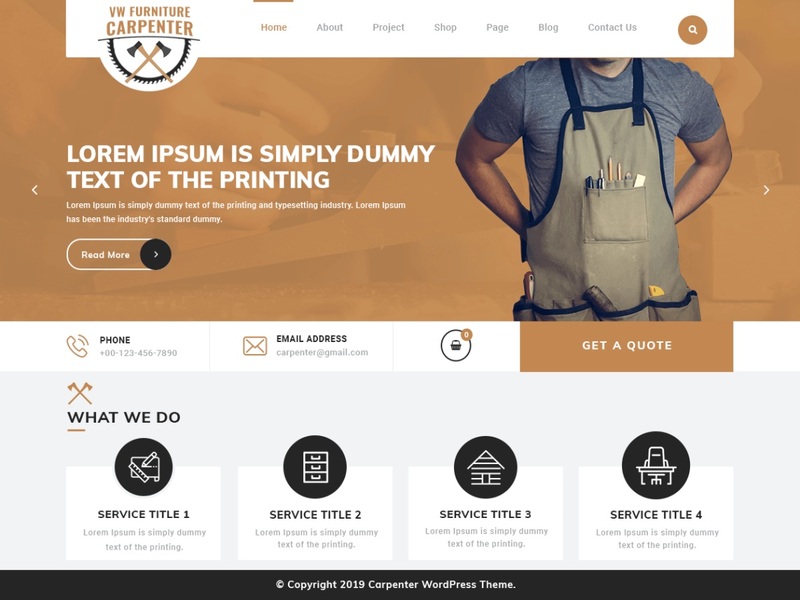 This WordPress Wood theme is also a preferred choice for the carpenters and joiners and also for builders and constructors who provide the finest solutions in the area of wood manufacturing and carpentry business. It is also applicable to the core in a case you are interested to make a professional and apt website related to the renovation services. Furniture and carpentry theme from VW is a good option for the home repair business as well as door and window installations. It also has tremendous use for air conditioning and solar system services. The credit goes to its string features like the multipurpose nature and besides this, it is not only minimal but sophisticated and elegant as well.